We’re racing now! The Competition Clutch Domestic Stage 5 – 1620 Six Puck Ceramic Sprung Clutch Kit features ceramic pucks riveted to the Competition Clutch high torque sprung clutch disc. This kit delivers a 120-200% increase in holding capacity with very quick engagement. 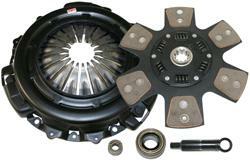 The 1620 Series assembly is an extreme duty clutch assembly for the serious street or road racer. This Competition Clutch disc incorporates a sprung center that dampens and reduces the impact and shock loads to the transmission. A serious clutch that delivers.